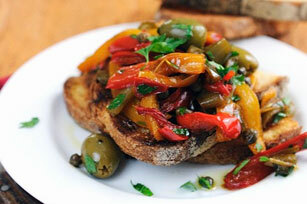 Garlic, green olives and capers ensure a colourful, flavourful tri-pepper bruschetta. Heat dressing in large skillet on medium heat. Add garlic; cook and stir 1 min. Add peppers and water. Bring to boil; cover. Simmer on low heat 20 min. or until peppers are tender, stirring occasionally. Meanwhile, place bread slices in single layer on baking sheet. Bake 10 min. or until deep golden brown. Add olives and capers to pepper mixture; cook and stir 1 min. or until heated through. Spoon onto toast slices; sprinkle with parsley. To prepare peppers, wash thoroughly, then cut away the cores. Remove the seeds and membranes. Wrap cut pieces tightly in plastic wrap and refrigerate to preserve the fresh taste and crisp texture.